Language tends to spiral like nature. As planets spiral around the sun, so the sun spirals around the galaxy. On earth, hurricanes spiral, picking up objects and pulling them into whirling winds. Vocabulary and grammar spiral as well, around the language learner. It is a dynamic system where chunks of language are brought together at different times and from different angles. Words are attracted to other words in phrases, paired with grammar, and used in writing. 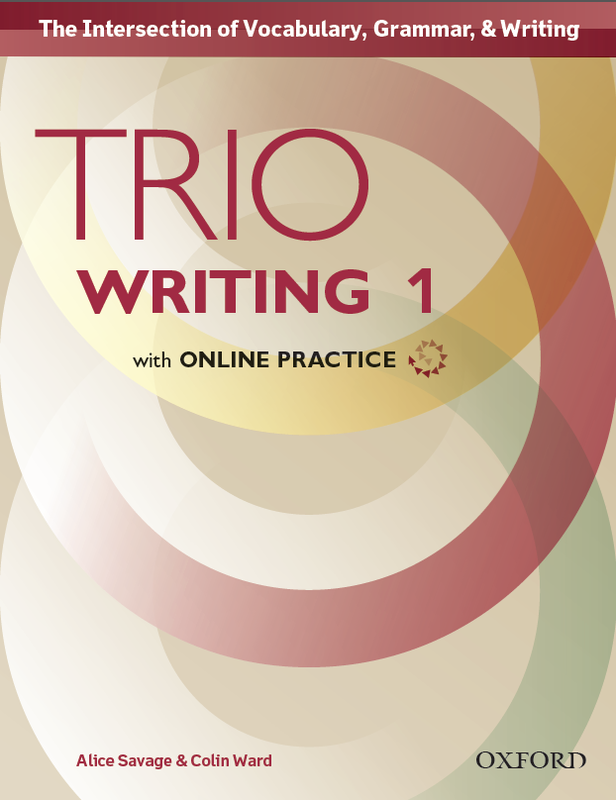 Trio Writing is a new series we’ve written for Oxford University Press that is based on a spiraling notion of language development. A low level series for beginning second language writers, Trio is a vocabulary book, a grammar book and a writing book all in one. We are pretty excited about it because Oxford University Press supported us in digging into some of the questions that we faced in our own low level writing classes. How could we teach writing to students without language? Which words? What grammar? How could we still give learners a voice? To select words, we turned to the Oxford 2000, a high frequency word list that provided us with key vocabulary. It was a good start but 2000 words was still a lot. To narrow the list, we looked at sample writing for the topics, prospecting for precisely the words that students might need. Interestingly, we found the content words we expected, but we also discovered that many high frequency words such as make or place played such a flexible lexciogrammatical roles in communication that we wouldn’t have thought to teach them for a specific assignment. It was like we had two lists, one for content, and one that was more shadowy. We called these words shadow words. A quick look at the research in corpus linguistics (Eli Hinkle, Norbert Schmidtt) helped us come up with a way to teach both: collocations. We discovered we could present content words with shadow words in phrases that lent meaning and grammar to both and could be mixed and matched to suit the writer’s purpose. The resulting chunks such as shop at famous stores, or crowded streets could be depicted visually and serve as semi-fixed units so that students could slot in different words (crowded stores, enjoy quiet streets). The result was the vocabulary section of each chapter. In the grammar section, the language chunks could be spiraled into sentences, thus recycling the vocabulary in longer texts. To choose the grammar, we went back to the writing samples, looking for precise target grammar structures and sentence patterns that supported the writing task. For example, in writing about themselves in the present tense, learners might focus on I like, I have, I play constructions without the interference of third person –s rules. 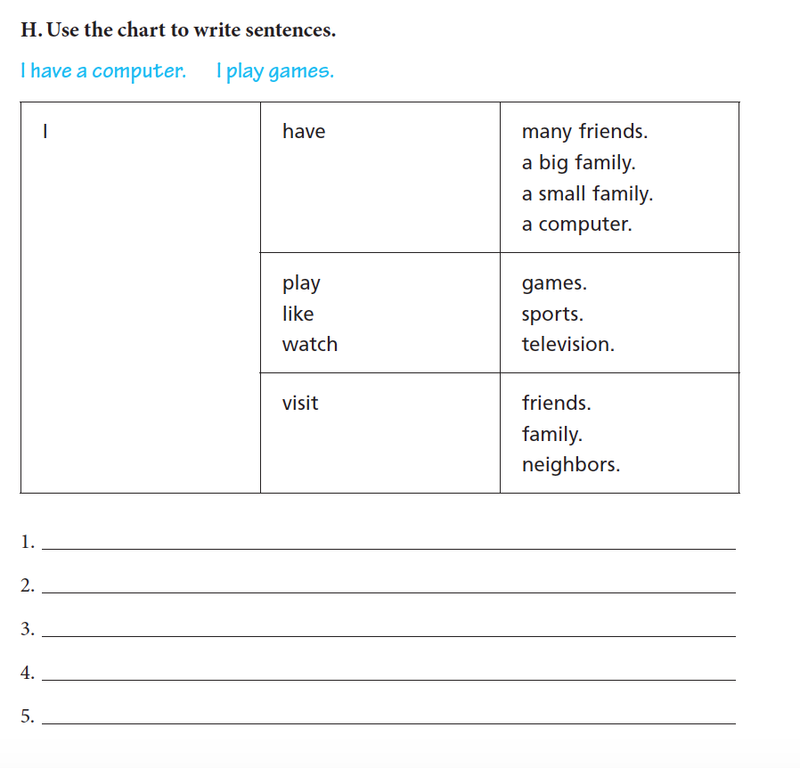 The grammar section could also introduce longer pieces of writing and give students a chance to test ideas. While the vocabulary and grammar sections supported the writing task by giving students language in advance, we also wanted to give students choices. As a result, our next challenge was to balance the language they had with choices about what they could say. A little more reading (Ken Hyland, Diane Larsen-Freeman) helped us find a balance between available language and student initiative. We could use questions to elicit the content then guide students in bringing it all together into a paragraph. For example, in the very first unit of the very first book, writers are given a choice of three adjectives to describe themselves: adventurous, quiet or social. They choose one and support it with details. For example, one student might write. I am social. I like people. I have many friends. I visit them. Another student might write, I am adventurous. I travel. I visit interesting countries. I see new places. This chapter-level trio of vocabulary, grammar and writing inspired us to think in threes. Why not repurpose the Oxford 2000 in three-chapter units? Our editors said yes, so we spiraled the target language through the units adding more vocabulary collocations and grammar with each loop. The result was a three unit book that looked at people, geography and money from personal and academic perspectives. The final trio was the series itself. 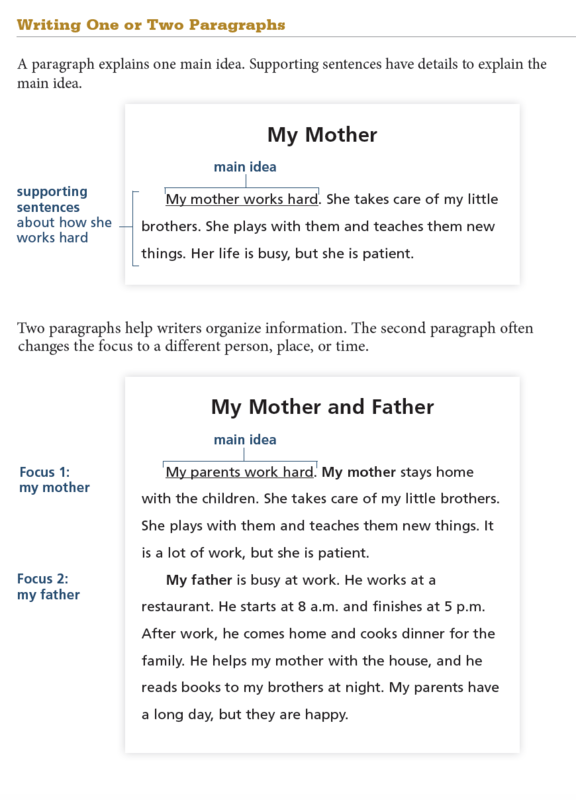 Book one focuses on the simple academic paragraph while Book two takes on paragraphing as a skill and supports students in making decisions about when and where to start a new academic-style paragraph. We embraced two-paragraph assignments because the more we thought about it, the more we realized that they supported the beginning writer in visually clarifying transitions between past and present, one person and another, one place and another, or one reason and another. In the third book, we moved on to three- and four-paragraph writing tasks. As in books one and two, vocabulary and grammar continued to spiral through the chapter, the unit and the book, building a dependable language base that could potentially free students’ cognitive resources for the critical thinking tasks of a more academic style of writing. In the third book, we also leveled up the challenge by including academic content. Every third chapter of a unit contains graphically represented content that students process in a short writing assignment. 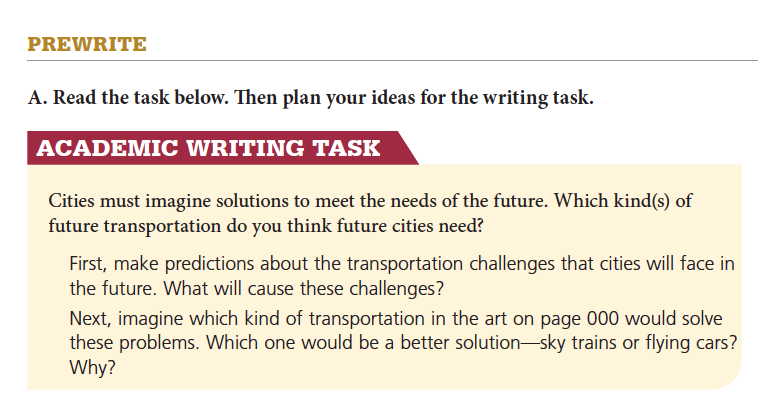 For example, in chapter six, writers respond to visual images of a sky train and a flying car and then evaluate which is a likely option for the future of transportation. For us, the Trio experience has sometimes felt like a hurricane as we spiraled across the SLW landscape, picking up ideas from research, our students, and our own experiences as writers, but it has been a great ride. We can only hope that that the books are as fun to use as they were to write! Please check out Trio on the Oxford University Press website.